What is the best stitch to use on the edges of a scarf so that they don't roll up? I'm using a chunky Malabrigo yarn with size 19 needles. 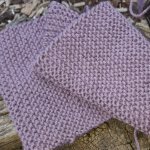 If your scarf is knitted in stocking stitch or a lace pattern, then the usual way to minimise the curl at the edges is to add a garter stitch border on either side. It doesn't need to be very wide, I usually do 3 stitches or so and it is plenty. All you need to do is to knit the first and last 3 stitches on every row. If you are doing a lace patterned scarf, I would suggest that you add on an additional 6 stitches when you cast on so that your garter stitch edge does not affect the stitch pattern for your scarf.